A little intro first. There have been two sheets/pieces/parts-of-hide laying around the materials bin for over a year now. This leather was received in trade for a pair of sunglasses, to be used for shoes at a later date. 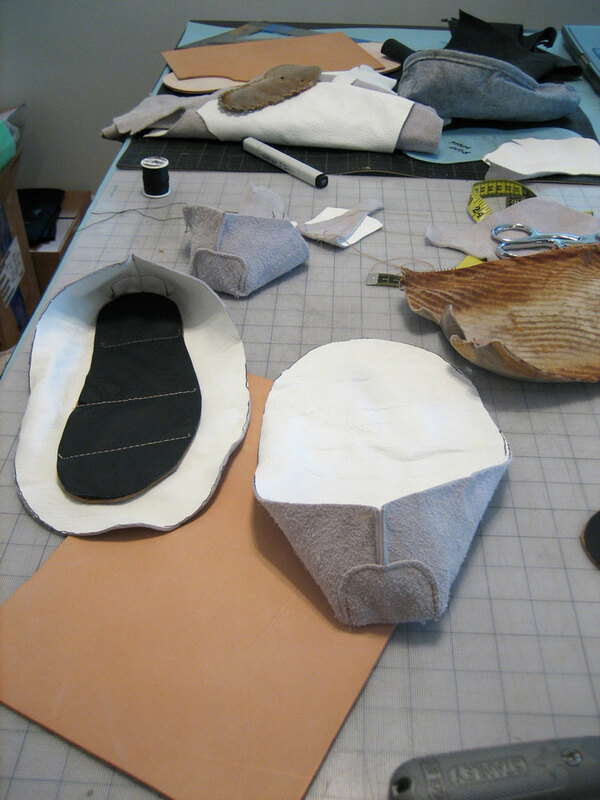 Both pieces together were roughly large enough for the tops of two pairs of shoes. Obviously since the leather is light-weight, soft, and sort of stretchy, it would not suffice for the soles of any shoe. So the two pieces (one which is navy blue, the other white) sat around for months. At some point they were used a little for baby shoes, but then were cast to the darkest part of the bin for many more months. Now, after some careful consideration, a bit of planning, and the encouragement of finding a local shoemaking supply store, it was finally time to put this leather to rest. Ideally, on some feet. Best guess is that this is chrome-tanned leather, it is very soft, very pliable, and does stretch in most areas. There are a few stiffer areas, but these are pretty random spots of rigor mortis most likely. That being said, a simple pair of Moccasins would be the perfect application. 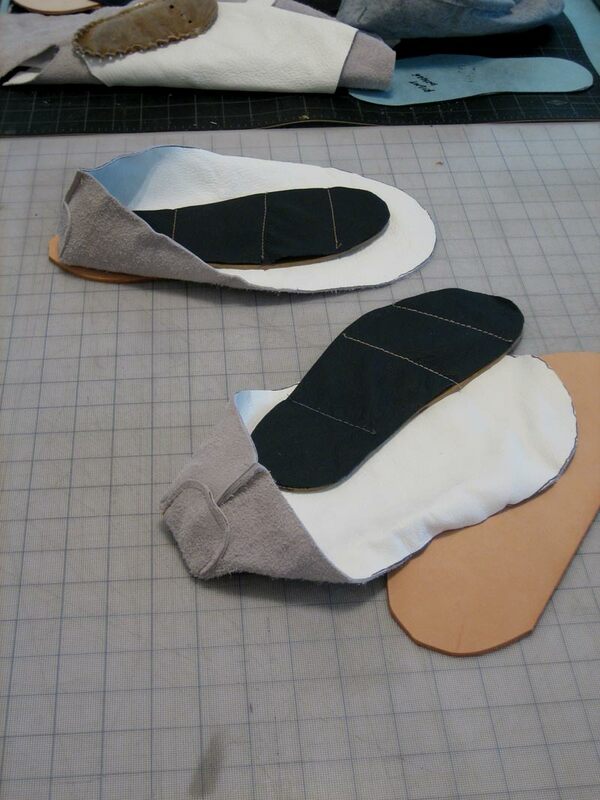 This would be a good reason to test out some different sole-ing methods and materials, as well as testing the hand at sewing. The first step was making up a pattern to work off of. 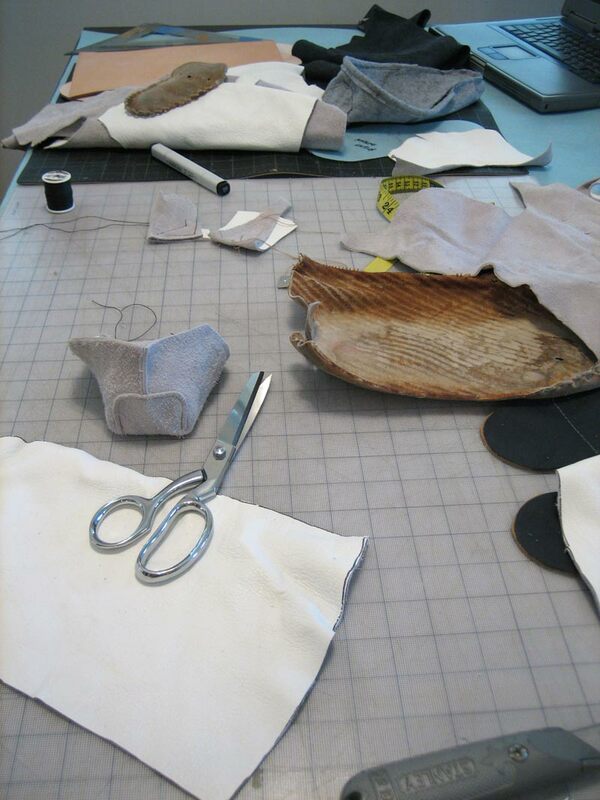 This consisted of making a felt Moccasin before moving into the leather Moccasin. 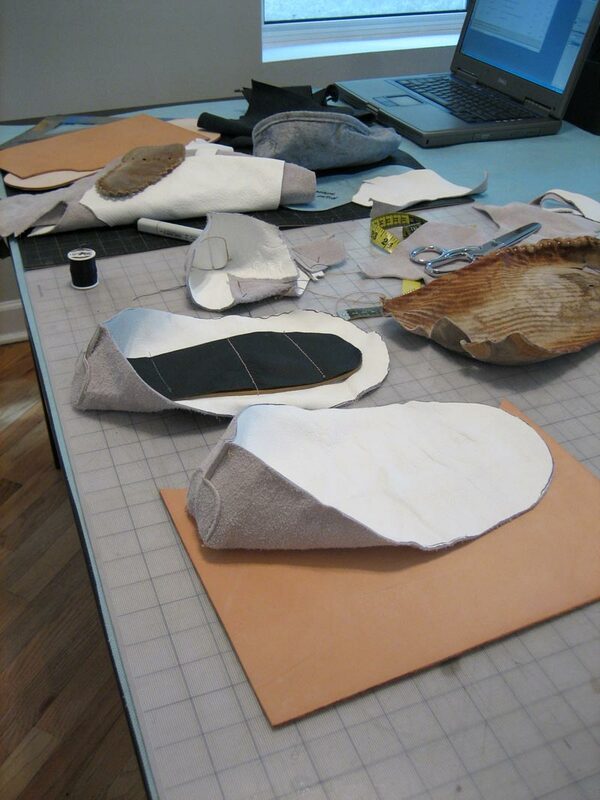 When laid out flat the pattern is essentially egg shaped with a flat cut across the fat part of the shell. Maybe it looks a bit more like an elongated capital “D”. Either way, once you have this, a couple of incisions are made at 90 degree angles to the flat side, when these two cuts are made it visually splits the pattern up in thirds, across that single margin. Next you bring these two outside edges together and stitch it up, leaving a little flap to get tacked into place across that seam. Luckily, because this leather is so forgiving (not stiff) it was very easy to sew on the Brother (because it was maleable enough to mash it around and get into the tight spots). All machine stitching of the upper was done with Gütermann “heavy duty” thread, which would include the strip of leather that goes around the back of the heel and houses the lacing. 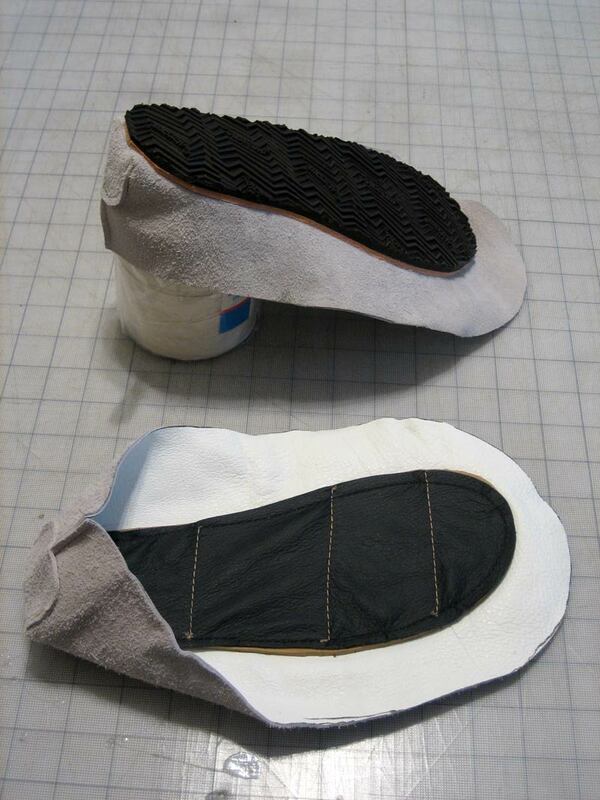 Next a form was devised to be used for the insole shape and the outsole’s shape (basically a generic, narrow, foot shape). With this form, two pieces were cut-out, one from the navy leather, and one from a piece of rubber sheeting, about 3/16″ thick (ordered a long time ago from Mc Master Carr). These two pieces were stitched together to form the insole, which was then carefully situated in a central position over the inside pattern of the Moccasin (at this point the heel is stitched into place, but the toe is still flapping freely). 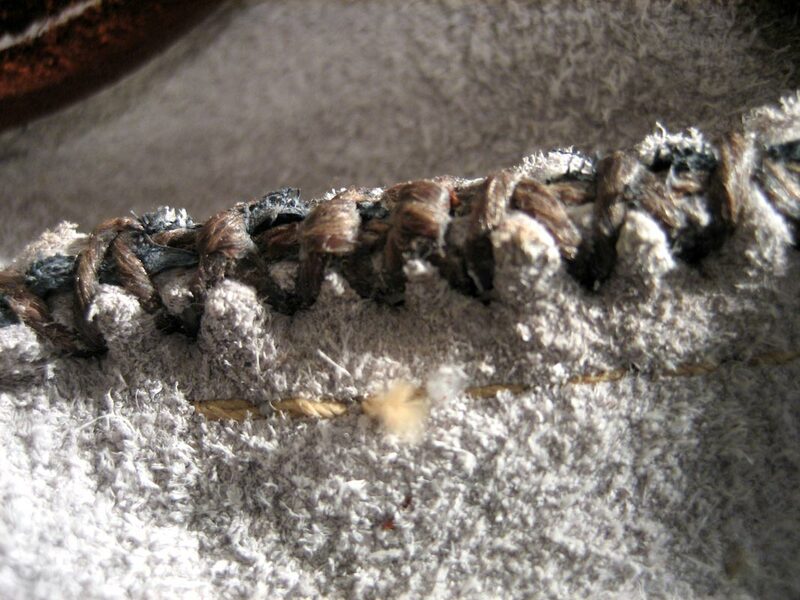 Once this was in it’s approximate position, heavy thread was loaded up, and the insole was stitched into place to the Moccasin upper with a corresponding piece of stiff vegetable tanned leather on the bottom (outside) of the whole apparatus. Looking at the Moccasin in a cross-section would reveal; leather stitched to rubber, stitched to the leather of the Moccasin main upper, stitched to heavy leather underneath all of that, with the leather piece on the bottom having a slightly larger perimeter than the insole’s. After all of that stitching was in place, the next step was to glue independently cut rubber sole-ing to the stiff leather soles. This piece was cut from a sheet of Vibram sheet/rubber/sole-pattern, with the rough shape cut out again a little larger than the last. The idea of this is that all of these will be cut together at the end (or when all of the glue is dry), so as long as the pieces are always a little larger than the last, they will line up with room to trim them all flush at the end. 24 hours later, the glue has set up nicely and the leather sole is firmly attached to the rubber sole. 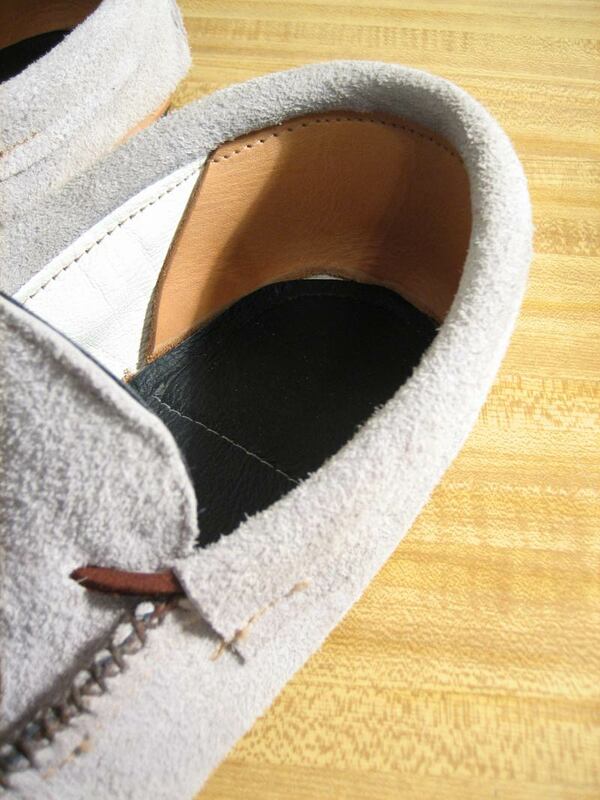 The insole is stitched with all of this on the inside of the Moccasin, and the heel-cup is halfway formed. 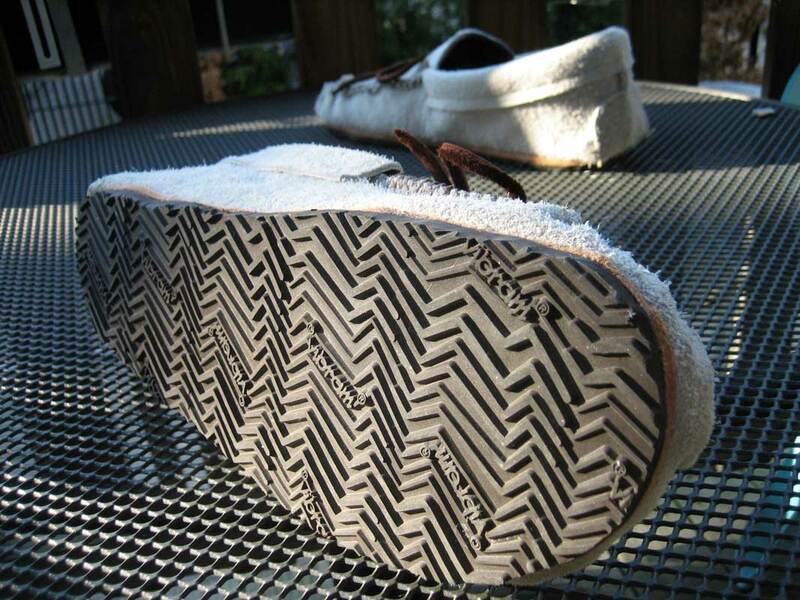 The next step was trimming off the excess sole. 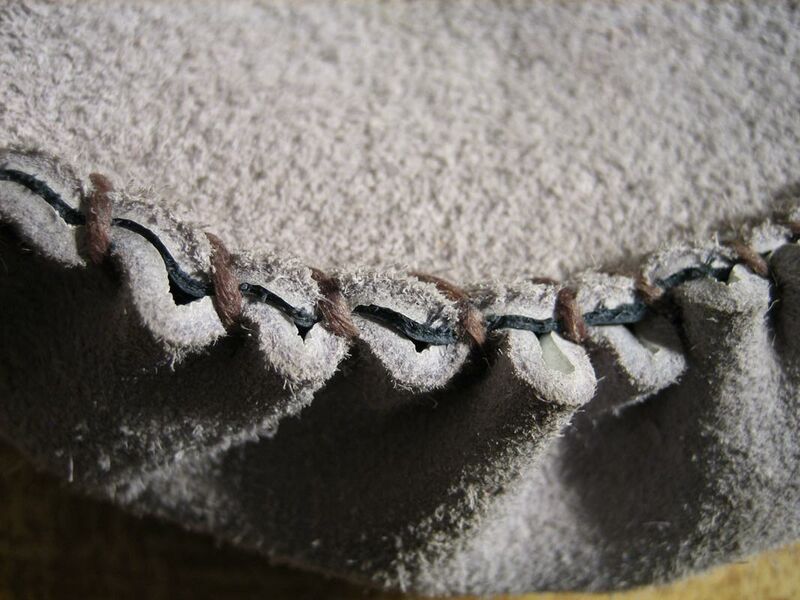 This was done by holding the leather of the Moccasin top tightly against the insole, and away from the sole (on the outside), and then trimming against that silohuette. The method for this is a very fresh knife blade, holding the shoe in your left hand, and the knife in your right (or vice versa if you are left handed). Going slowly and carefully, you want to pull the knife around the sole towards you (not away). While this may sound more dangerous than cutting away, it is actually much more stable – cradle the shoe in your lap for a more secure stance. If any of this does not feel natural, then reconsider your position before moving on. With the sole cut to shape, the rest of the heel cup was ready to be addressed, at the same time, the strip of leather – housing the lacing – would be installed. In this case the heel cup’s stiffener was just a bit of vegetable tanned leather cut into an isosceles trapezoid, the wider edge is the bottom side, the narrow edge is what was stitched in at the top of the vertex of the heel with the lace housing. This was done in the manner of installing bias tape, except instead of having both sides folded under, only one side is (the side facing the inside of the Moccasin). With that stitching holding the top of the heel cup reinforcement, the bottom edge is wedged into the channel between the insole and the upper leather. The reason for not sewing the heel-cup stiffener in against the outer was partly due to aesthetics (wanting to avoid excess stitching on the outside of the shoe without much explanation), and two, in-case the heel cup did not do it’s job and needed to be taken out later it would be much easier to remove. 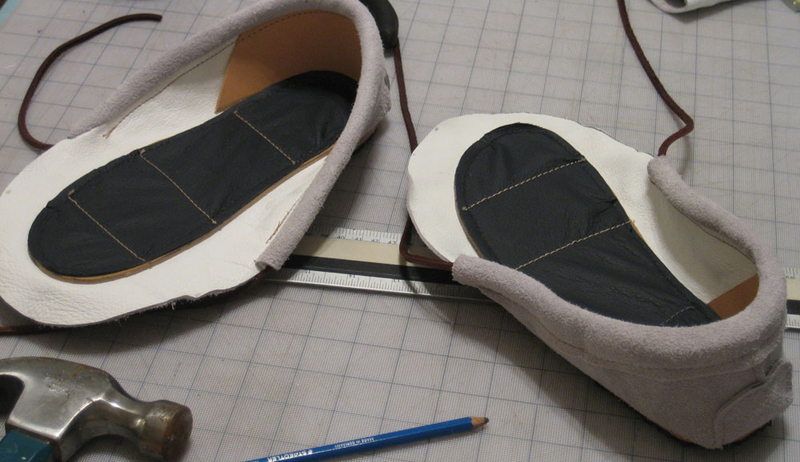 So far, the only adjustment would be in the shape of the leather piece used to stiffen the heel-cup, it could have been a bit more accurate to the specific dimensions of the heel, to cut down on it moving around independently of the upper (which is not very much, but could be better). Installing the toe piece would be the last step. It is another pattern that has a roughly egg-shape appearance, although one end of the egg is squashed a little. This piece was two pieces of leather sewn together, the white for the outside, and the navy for the inside lining, the idea being the extra bit of material would help keep it stiff, although this is probably unnecessary. With the two pieces stitched together and trimmed clean it was then time to do the hand sewing. First of all thread; the thread to use here is a pre-waxed linen thread, the wax helps keep the thread stiff and also aids in passing through the leather pieces without all the tugging from friction. In the best case scenario you can actually shape the waxed thread and use it’s natural stiffness as the needle, however two needles were used here to make the process a little easier. With about a yard and a half of thread, a needle was placed on each end with only a few inches of excess. 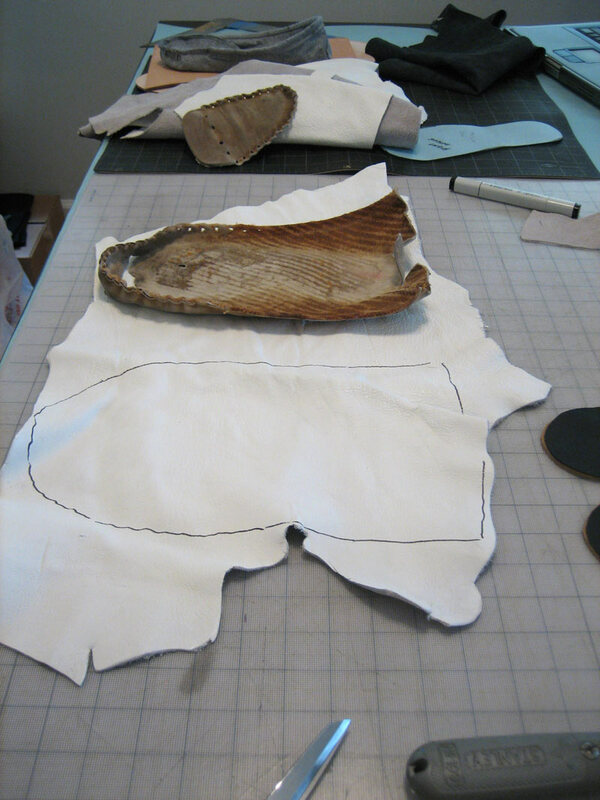 The pattern for stitching is to create a coil form going along the edge of the toe piece in accord with the material from the leather upper of the almost completed Moccasin. While doing this methodical stitching you have to pre-puncture your holes one at a time as you travel the perimeter gathering some of the leather from the upper so that each stitch has a little pucker on the leather from the upper. The reason for this is that the actual measurements of the two materials being mended together do not have the same length, also once you gather and pinch/pleat/pucker the materials from the bottom completely, the toe will then have it’s lifted shape creating the lip which makes room for your toes. With these stitches in place, the Moccasins were finished. Following up – addressing the technical issues: First of all, the leather used here provided quite a bit of insight into how durable and workable leather really is. This leather was very soft and pliable, with that in mind it is even more surprsing at how much it could withstand. It appears that leather is almost un-breakable by the bare hand. After poking, and prodding at it with very tough stitching work, it is amazing that it never gave away or ripped. The only shortcoming may be in picking out the right leather to use for any given project. Although this particular leather made a very well constructed and comfy Moccasin, it probably would be better for a light-weight bag, or other small carrying container. For the Moccasins it was just a little too soft, which maybe, made it less suited to long exposures to outdoor use as we would have liked. Next time around, considering a stiffer leather that can support the foot more should help. Otherwise it is superb. 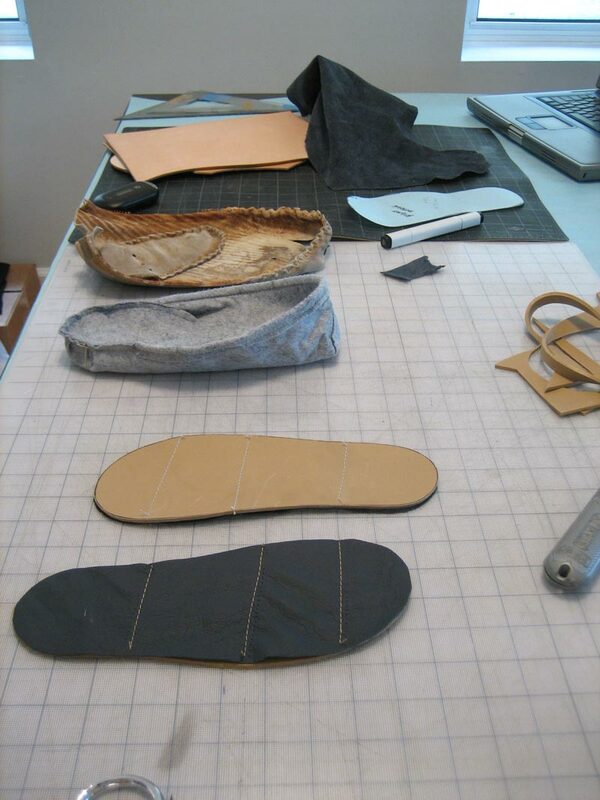 Another technical issue is in constructing the soles. 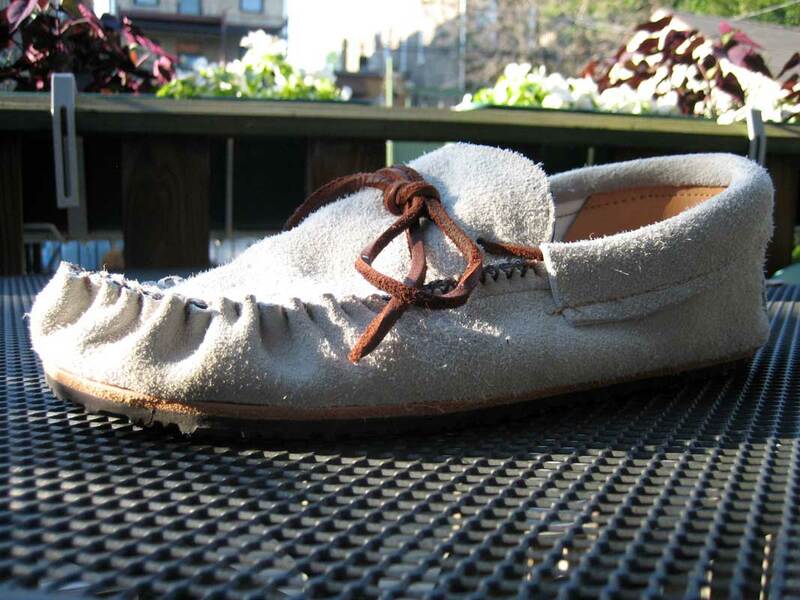 After reviewing the process, the entire sole-ing method would have benefited by only stitching on the mid-sole on the bottom of the Moccasin, and using glue for the insoles. 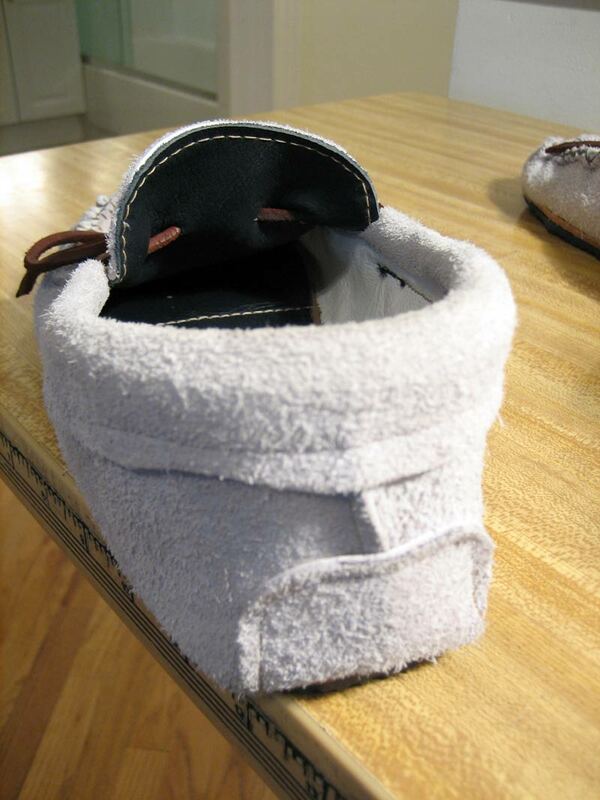 That would allow the builder to make the shoe around the footprint, instead of making the footprint around the shoe. Plus, all your inside work would be consistent smooth leather. Also, when stitching through all four layers (starting from the top; leather, rubber, leather, leather) it is more difficult to determine your thread tension. This is for one main reason, whilst you can have everything adjusted for a test run on some miscellaneous spare material, it is not usually at the speed, or many curves that your actual piece’s may be. Lesson being, watch your thread tension carefully, and if you are stitching slowly, keep the tension a little higher*. For the curves, practice, practice, practice, doing them in one motion, the less you have to stop the better. * The rule of thumb is to keep the tension on the bobbin case as loose as possible, and always adjust accordingly from the top. But, as you will see, for very fine threads, you may still have to increase the bobbin case’s tension. It is when you get to the heavy larger gauge threads that even with the bobbin case’s tension set as lightly as possible, it will still outwweigh your top thread, in which case; Don’t be shy to really crank the tension up on the top thread to get your stitching in order, it may even take a few full turns of the knob. 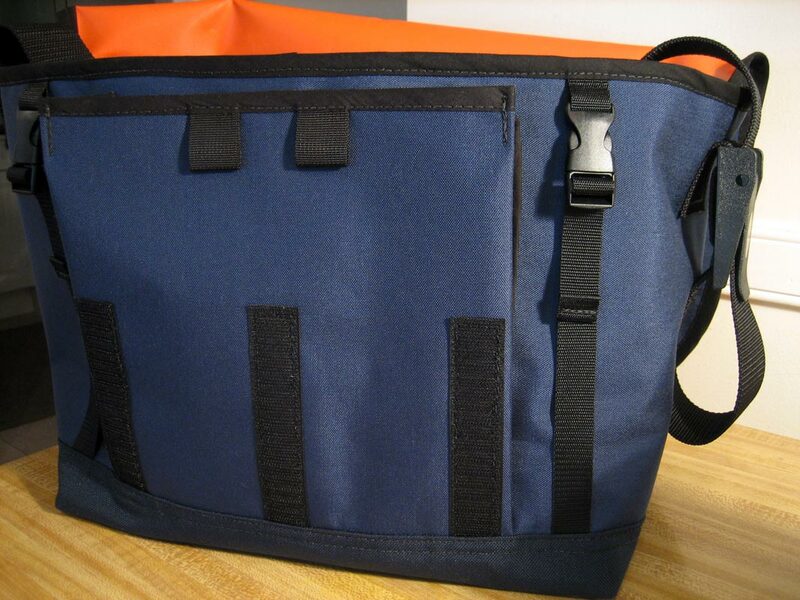 For all intents and purposes this is a simple bag. The 500 denier Cordura was a good light-weight alternative to work with instead of using the 1000 denier body and Ballistics boot. Considering the size of this bag, and its intended use, Ballistics and 1000 denier would have been heavier than desired. 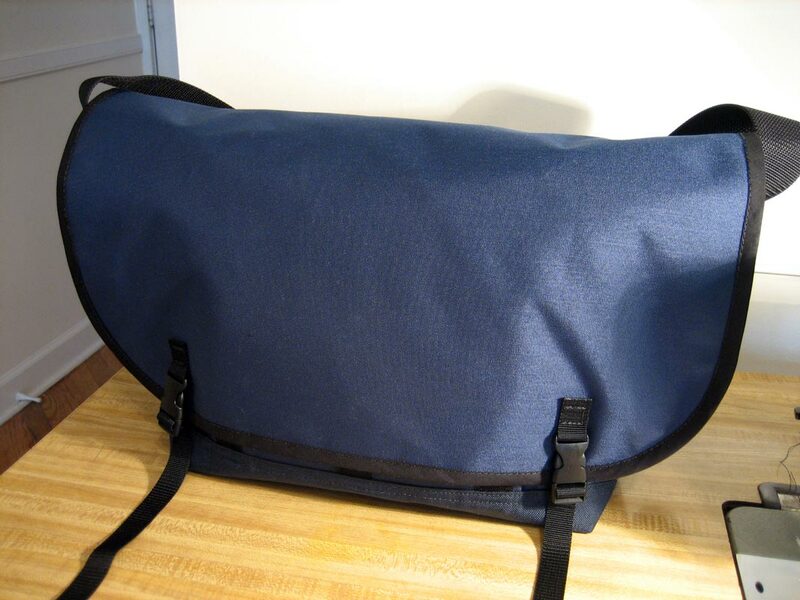 The 2″ dive belt webbing made a much more complete bag. If seatbelt webbing had been used then the cam buckle would probably not (have) work(ed) as well. Seatbelt webbing is too thin, and with its smooth pliable finish, is prone to slithering its way out of your normal pinchers used in cam buckles. The dive belt webbing was easy to work with, with the 21 gauge needles and Coats&Clark “button & carpet” thread – not to mention (welcome the bias) dive belt webbing simply has a more secure feel, and trustworthy stance. 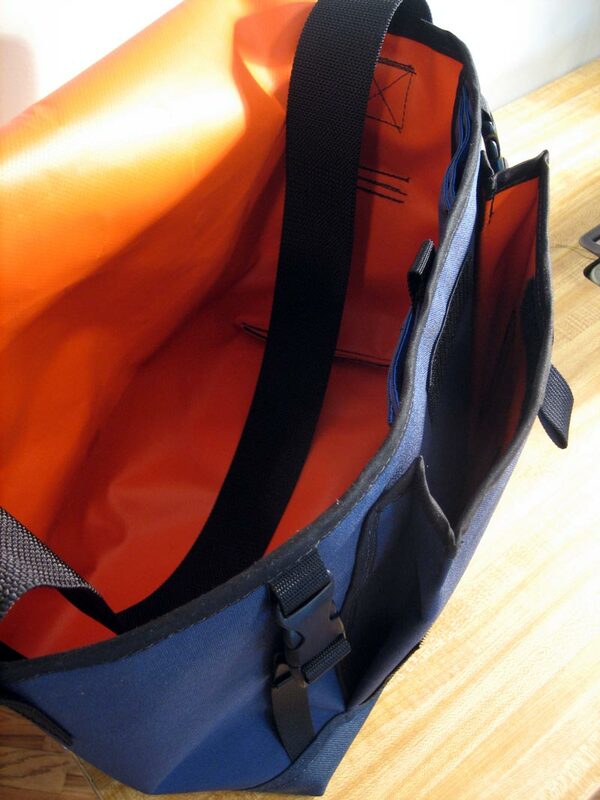 However, as mentioned in previous posts, if you were to build a bag that had a two-sided adjustment using a larger 2″ side-release buckle (like on the Dow Bag), then the seatbelt webbing is a must, as dive belt webbing does not easily (if at all) work in a ladder-lock-sliding-type-situation. The DB-92 thread was a fantastic alternative to the previously used Güterman “extra strong” thread, it has a bit more tooth to it, was extremely strong to the pull, and the elastic quality was low*. Also, it makes a very clean looking stitch, so all the topstitching looks professional (as it should). 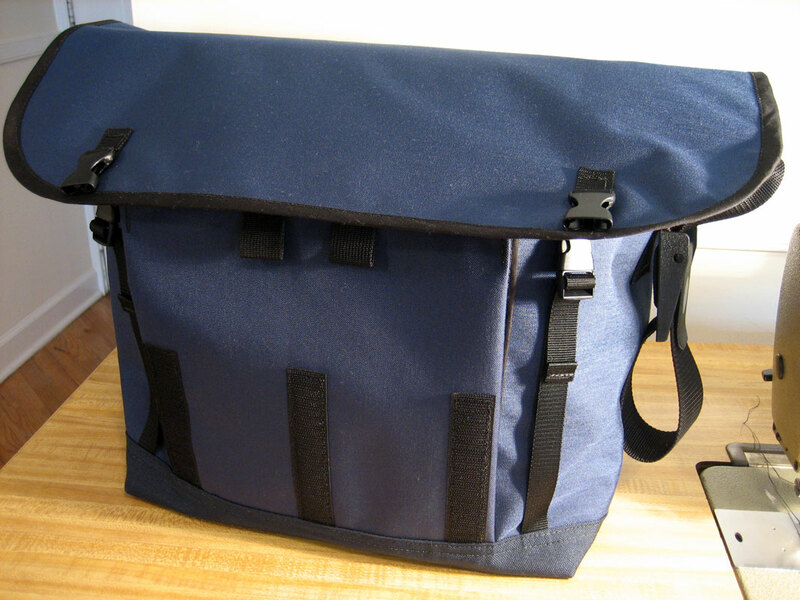 Overall, construction of this bag was simple. 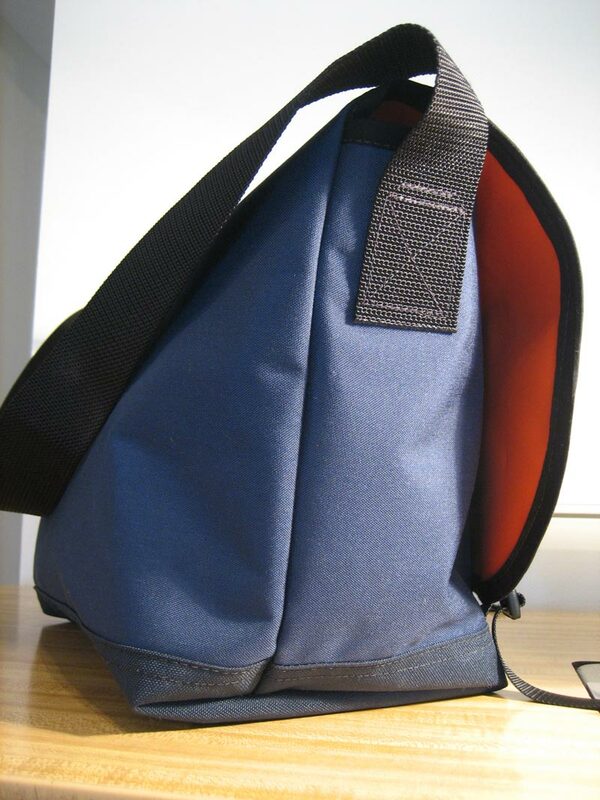 The main compartment is the basic format, with the front panel comprising a little more of the entire girth of the bag, than the back panel. 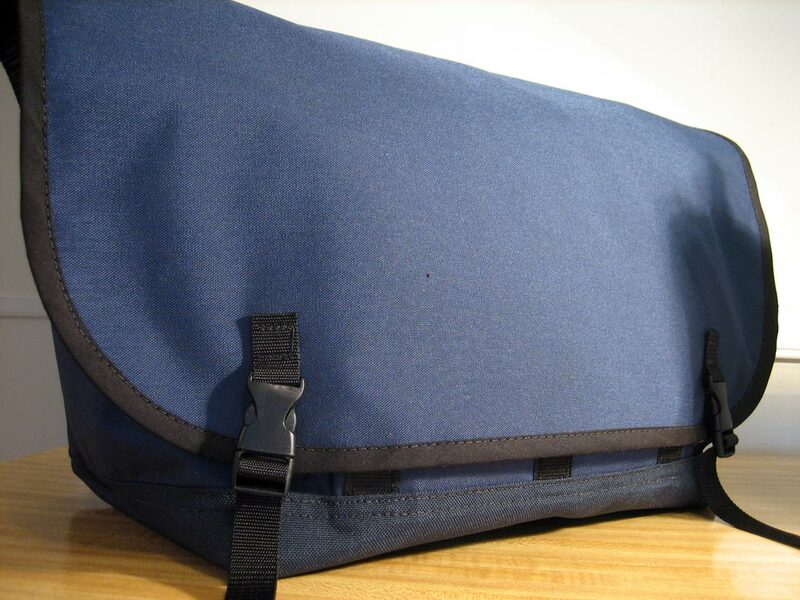 Across the front is a single billowing pocket with Velcro closure, lined with some of the 18 oz. vinyl coated nylon (also used for the main body’s interior). The only thing done differently with this billow pocket from the last few made, was that it was stitched together as two separate pieces, using bias tape all the way around (instead of using a “French seam” across the top, and bias tape only on the sides). The difficulty of using bias tape for this is how to turn corners (90 degree angles or not) and keep the shape precise. Bias tape can do it, as it often does, and even here you can see that it works very easily in large radius rounded corners like that of the flap. But it seems that this will be a trial and error exercise, with a lot more practice before it is perfected (any advice – out there – would be appreciated). Either way, the bias tape is still nice and tight, and certainly protects edges** and any other fraying from happening. The flap uses the common combination of Velcro and buckles. The Velcro was set up to be minimal to ease in how hard you had to pull when opening the flap (on the Dow Bag, you really have to pull on it due to the 4″ wide Velcro). One upgrade on the buckles is that there are a second set of anchor points for the straps, for, if and when the straps are not being used. 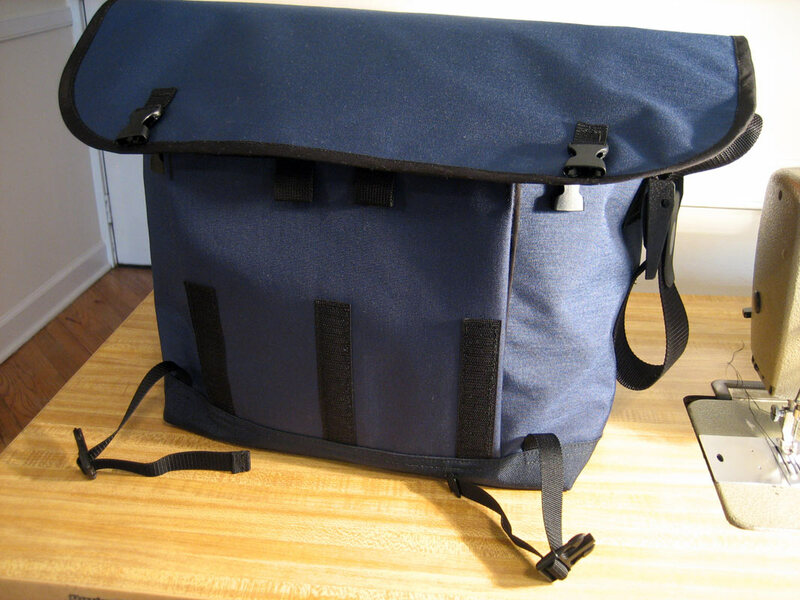 This is becoming more common on current “messenger” bag designs, and entails placing two receiving ends of the same size buckle, into the top seam of the front panel of the bag. This is a fairly good idea, as half of the time (if not more) that these bags are in use, the straps are unnecessary, and this gives the buckles a place to be tucked away instead of them dangling about. 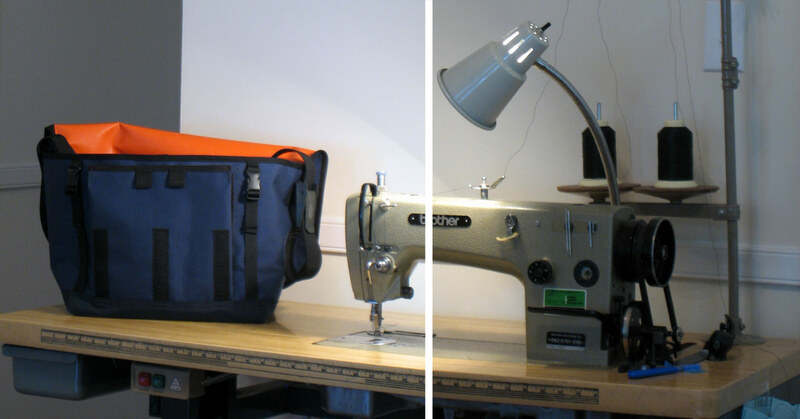 The interior of the bag uses a simple 5 pocket set up. No zippers this time around, just a bit of Velcro on the largest compartment. Also, all of the inside pockets are lined with 1.9 oz. silicone coated ripstop, to keep things clean without adding too much weight. Finally, back to the shoulder strap. 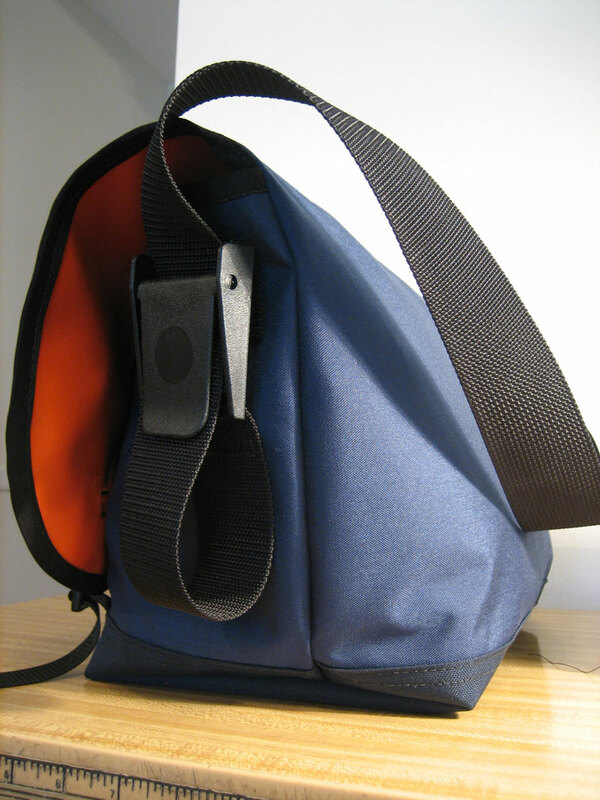 The cam buckle was installed with the 2″ dive belt, which is all one long piece that runs up from the cam buckle and then over itself again to the other side of the bag. Instead of using the Coats DB-92 thread on this last component, the needle and thread were switched out for the heavier Coats&Clark “button & carpet” and the 21 gauge needle to permit the stitching to pass. With everything in order the bag was complete. * One thing to consider in the thread topic, is how much does your thread stretch. One hypothesis could be that certain applications call for a thread with no stretch, while others call for lots of stretch. All subjectivity aside to applications like making a garment out of lycra, which would otherwise definitely call for a bit of stretch in the thread, what is more peculiar, is where and when this stretch factor might enhance the structure (or not). Take the Silk Jeans for example, that thread (100% silk Güterman) stretched at a rate of about 3% (in simpler terms, a fair amount of stretch for thread, but definitely not overboard), that was just enough to cause some of the seams to pucker up a little after they were stitched together, thus creating that somewhat specific look that factory hemmed jeans have, and often lose, when they are hemmed at home. Consider that the thread is being stretched a little bit every time it is on the uptake which means that the actual length of the thread, per stitch, is a little shorter than the length of the material stitched. Therefore when the thread is in place and pulls back against the weave of the denim (in this case) it causes it to bunch up a little (by little, that means hardly at all, but when all these thousands of stitches are added up, that accounts for a lot). The same scenario is true for very in-elastic thread, but with the opposite results. 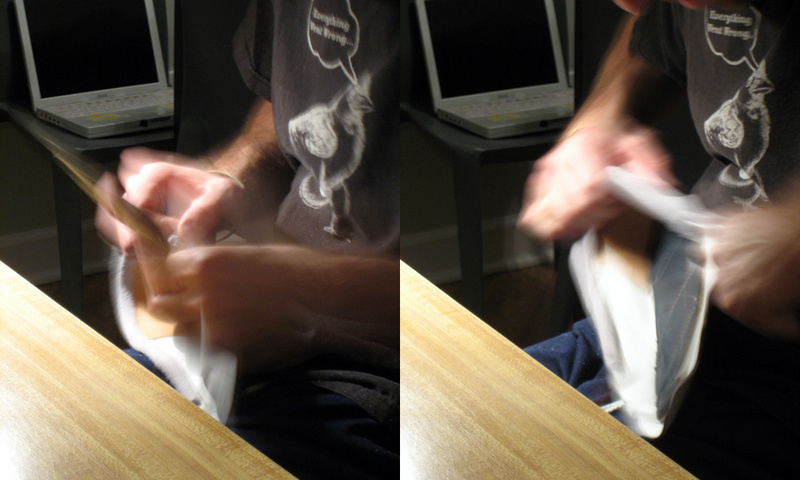 A good example is when sewing very light-weight nylon, like the 1.9 oz. ripstop used on this bag. Because this ripstop is so light it tends to be easily pulled in and out of position, so in order to keep it in place and not shift around, a thread less prone to stretching is desirable. If something more elastic were used, then when the seam is in place, the material will be pulled short from the thread contracting (because the denim was so heavy on the jeans, this factor is greatly decreased) causing poor alignment. ** Because the Brother DB2-B791-015 is a needle-feed machine, the issue of using “folders” for trim/bias-tape/edging, is questionable. Surely there are “folders” for this machine, as the bed has the right anchor points tapped into it. However, that kind of tool is hard to find for such a specific machine and will have to wait until the next inflow of cash comes in, and maybe even the next trip to the Los Angeles Fashion District’s industrial machine shops. 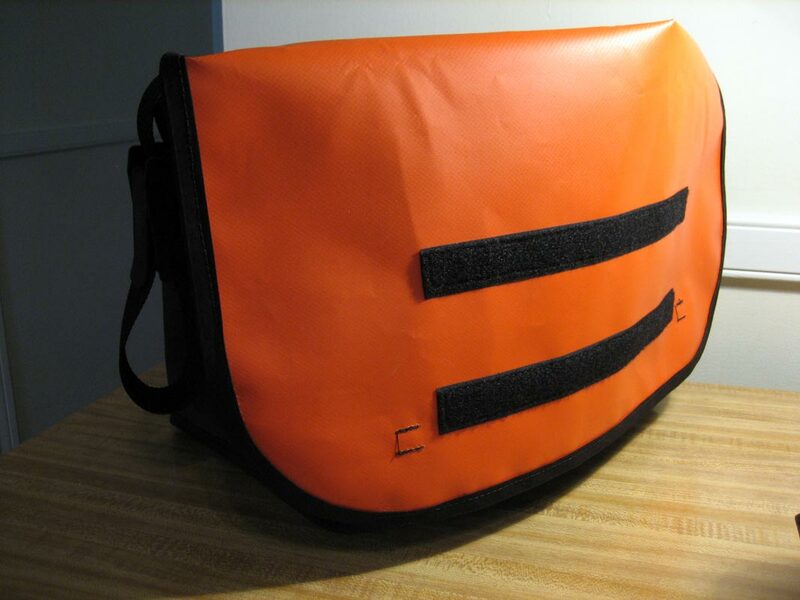 Definitely, in this case, a good “folder” for 1/2″ tape would be ideal for making bags like this one. You could use real nylon ribbon too, which would be much more durable than the cotton type we’re using now, found at the fabric store. <<< Excerpts from earlier rambling drafts. Construction materials: 500 denier Cordura Nylon for the main body, interior pockets, and outside billow pocket – 1000 denier Cordura Nylon for the bottom boot – 1.9 oz. silicone coated ripstop for the interior pockets – 18 oz. 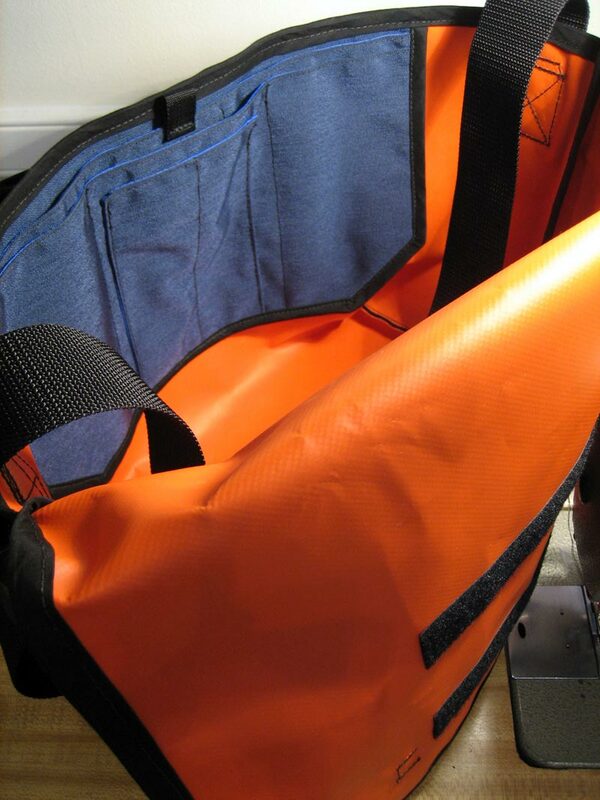 vinyl coated polyester for the main interior – 2″ dive belt webbing for the shoulder strap – Coats DB-92 polyester thread for all stitching except for using Coats&Clark “button & carpet” for the shoulder strap and adjustment buckle. Other misc pieces are the usual side-release buckles, Velcro, bias tape, and nylon webbing (in this case 3/4″).